Oxford will always be my home city. Whilst I was born and raised in a small town just outside, it is always the place I say I'm from. It's also the place I went on my own for the first time as a 15-year-old, went to the cinema at 16, when to the clubs at 17 years old and continue to go back for days trips with friends and family. However, I have barely scratched the surface of some of the beautiful things you can do there, so I took myself around the compact city to see it as a tourist and rediscover it. Start the day with breakfast at George Street Social. The indie cafe is full of board games and books, but my favourite part is the stairs styled to look like hardback books with titles changed to be Oxford centric. Of course the delicious food and coffee is nothing to be sniffed at, especially when they do a bottomless brunch at weekends for prosecco lovers or Bloody Mary fans. It's then worth just wandering the streets for a while. The abundance of historical buildings are fascinating even for non-history lovers. And the sheer number of bikes throughout the city is a refreshing change and means that pretty much every gate and railing is battling for freedoms against the mechanical metal. However for the best view of the city? Head up Carfax tower. It costs just £2.70 and is a VERY narrow and winding staircase with 99 steps but is worth it for the beautiful view of the city with the green hills surrounding it. Take time and soak it all up. For the best afternoon tea, it has to be The Grand Cafe. As the first coffee house in England in 1650, it's just another part of the ancient city to explore. The mirrors walls, plants throughout and the intimate nature makes the afternoon tea of scones and sandwiches all the more delectable. Part with £3.50 for a boating hat and grab a punt. The famous long boats are famous in both Oxford and Cambridge, and the perfect way to go down the river. Get a few drinks as you drive the boat yourself with friends or hire someone to do it for you, just always make sure you let go of the stick to avoid falling in. For just £22 per boat, it's a great way to spend a sunny (or even rainy) day. 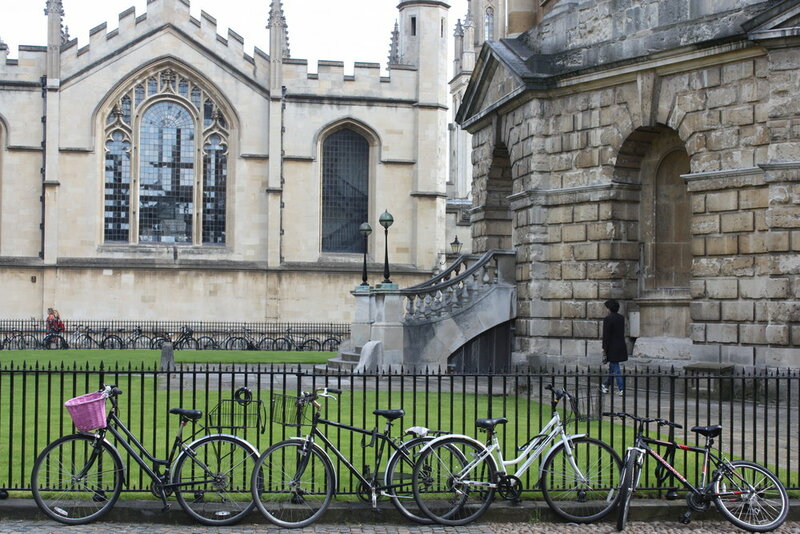 There is enough throughout Oxford itself from its history without all of the shops and the cafes to keep you occupied with the university town being one of the oldest, first being mentioned in 911 and the university in 1167. The Covered Market, whilst often smelling of fish from the fresh food stands, is a sight to wander around even without going into the (somewhat touristy) shops. Also seeing Bodleian library from the outside due to it costing to go in, and the famous Bridge of Sighs makes it all part of the old iconic city. From Magdalen University where the great hall from Harry Potter is filmed to The Bear Pub, the oldest pub in Oxford (built in 1242 and even had a resident bear), or even the Eagle & Child, where CS Lewis and JR Tolkien once frequented; it offers everything with his history and literature for everyone. 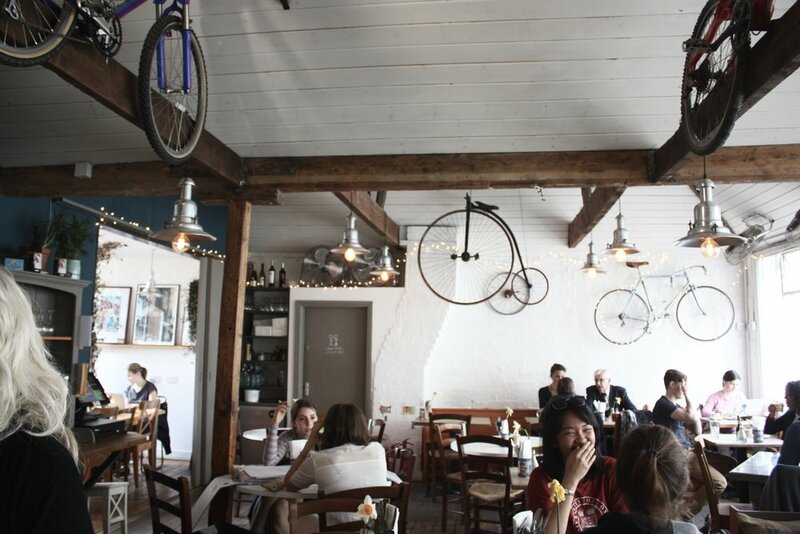 As the light is fading, a hidden bike shop that poses as a cafe is great for a tea stop. With big windows letting the last of the sun in and the mush mash of bikes tied to the ceiling, it's a popular spot for students with laptops, many of which are most likely waiting to get their bikes repaired.